My husband surprised me with a pretty yellow and white bouquet this week. I placed it on the dining room table near some light green hydrangeas I had already brought in from our garden. 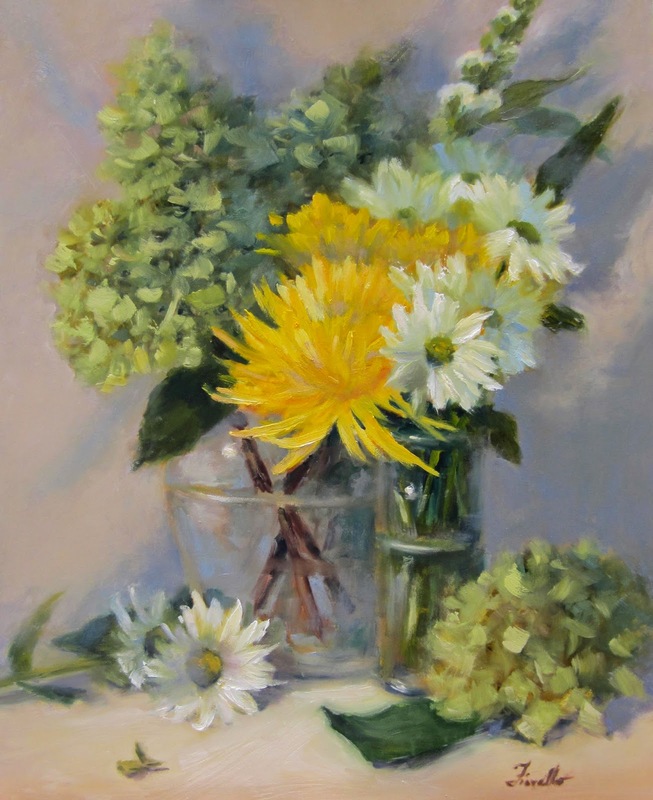 I loved the color combination of the 2 bouquets together so that became the inspiration for this oil painting. Did a small 6 x 8 study in preparation for a larger oil painting I plan to do in the next few weeks. Working on getting the sensation of the brilliantly sunlit fields in the distance yet still having a sense of depth. Doing a larger watercolor of this scene for a commission project later this week, so thought I'd do a quick study to begin to familiarize myself with the scene. Had a little fun with artistic license on this one. Changed the chair pads to red and the wine to red to complement all the greens. I arranged some hydrangeas and dahlias for a demonstration in my watercolor workshop last week (see previous blog post) and wanted to try the same arrangement out in oils. I created short youtube videos showing the basic steps in the process for each so you can see the very different approaches required for the two different mediums. Here's the oil video and the watercolor version is with the watercolor painting posted on my blog on 8/12/14. Please share with those who you think might enjoy this! P.S. 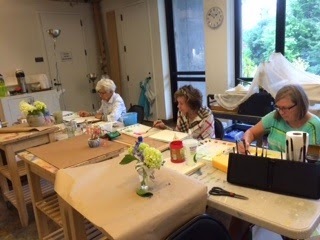 If you'd like to have a moment of beauty every day, "Like" Pat Fiorello, Artist on Facebook and follow my "365 Days of Beauty Campaign"
Spent last Thursday and Friday up in beautiful Highlands, North Carolina teaching a 2 day workshop "Capturing the Essence of Flowers in Watercolor"
Had lots of fun with a great group of students. I made a quick video of the demo painting I did so you can see how it unfolded from start to finish. Press arrow below to play. In watercolor it's easiest (though not the only way) to work light to dark. I may try to do this painting in oils as well- the complete opposite process- working dark to light and will share that when I do. 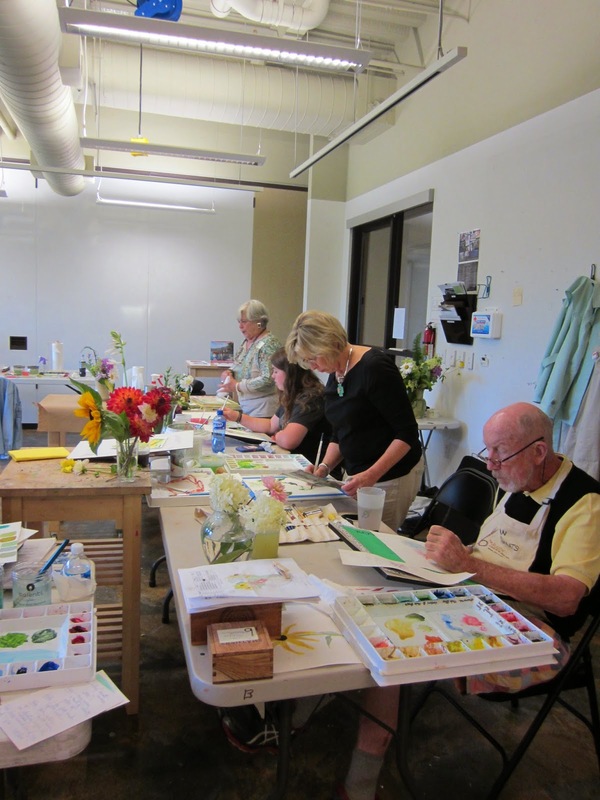 I'll be back at the Bascom teaching "Painting Landscapes in Watercolor" October 22-24. It will be a great time to be there while the leaves are changing this fall. For more information or to register and join in the fun click on The Bascom . 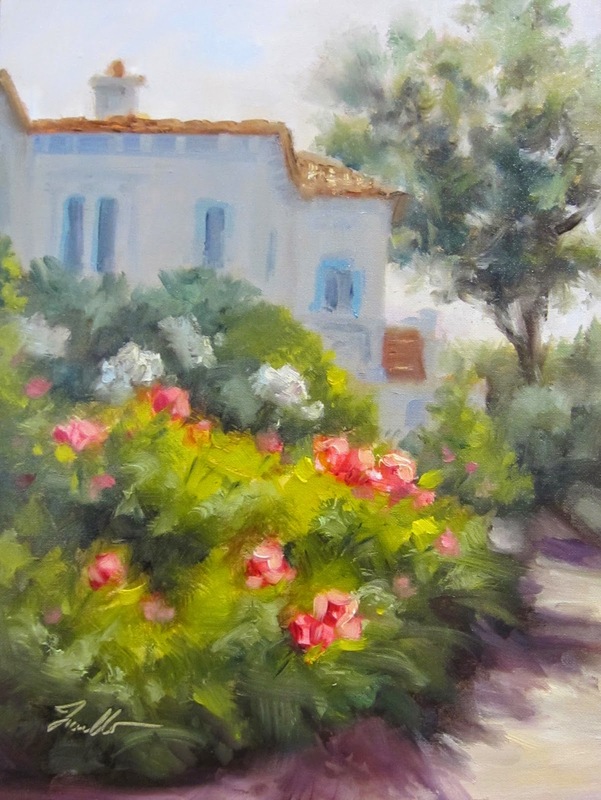 Today's post is a recent painting of a "Sunny Afternoon" inspired by a scene from the gardens at Hearst Castle in CA which I visited last June. While in N.J. recently visiting my family and my friend Jean in the charming town of Madison, N.J. (yes, if you've never been there, there are many beautiful spots in NJ- it is known as the "The Garden State" despite it's late night comedy reputation). 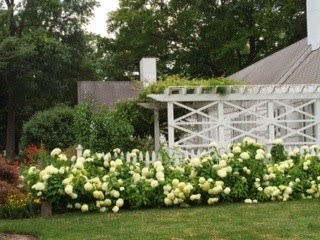 When I got home I cropped in to make more of the white hydrangeas which initially grabbed my attention. I simplified the architecture down quite a bit, changed some of the other flowers and, okay, I probably went overboard on the hydrangeas, but it captures how I feel about them (an abundance of love and excitement) more than reproducing the scene literally. 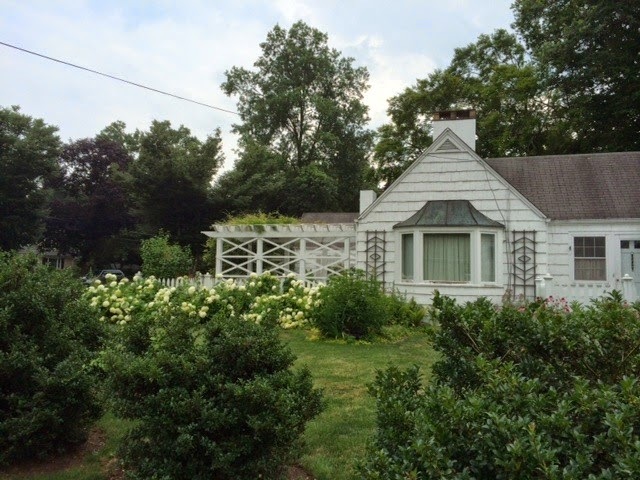 I love the combination of the white house and white hydrangeas against all the green foliage. It has such a fresh look and this type of foliage reminds me of my time growing up in the Northeast. "Hydrangea Garden" above is the painting that I completed earlier this week inspired by my "drive by" in N.J. 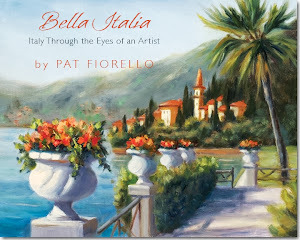 Enter now to win a postcard painted by Pat Fiorello! 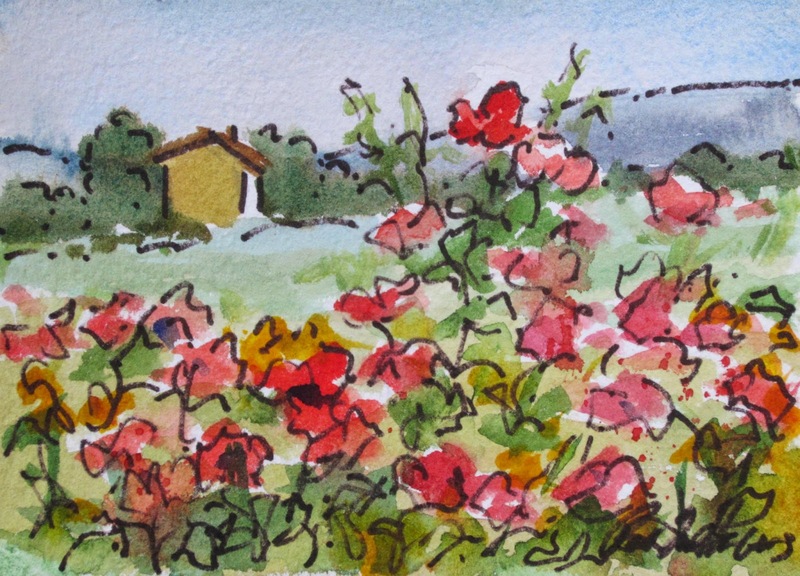 Click on link to learn more on how to win this postcard of Provence painted by Pat Fiorello .